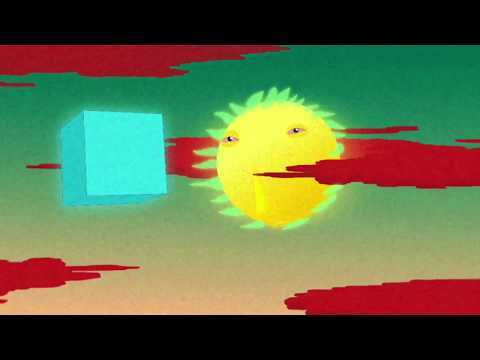 Self-taught Auckland-based animator channels retro acid sci-fi for "The Cube: Part Four"
Frances Haszard is an illustrator and self-taught animator based in Auckland, New Zealand. Her often trippy work generally takes place in the digital space between music and its audience, making her a perefect addition to the team guiding the ADC Cube on its momentous "six sided adventure." We reached out to Frances to learn more about "The Cube: Part Three" and its psychadelic influences. Every kid gets a pack of crayons when they’re young, but you rarely hear kindergarteners say they wanna be animators when they grow up. How did this become an interest for you? Drawing definitely took up a large part of my time as a kid; it was something that I did for play, and for me that aspect of it is still so important. I never felt discouraged by teachers or anything, but figuring out how to incorporate that into my adult life was definitely awkward. My first animation was in the corner of an economics text-book, so it took a couple of years to figure out that it was going to become my primary pursuit. I can't say that animation was something I ever "wanted to do" professionally as they say, but something that I could always see ways of improving so have never been able to move on from. Its kind of an obsession. What were the steps that you took to make this obsession of yours a career? Animation has been something that I teach myself and I enjoy that aspect of play and sense of autonomy. I ended up studying Art History and that has definitely informed my work, but in terms of learning how to animate- that is something I've done on the job. Putting animations out into the world is always very humbling — I know they aren't perfect- more of a stage of growth and learning. I think it's generally quite a forgiving medium though as it is inherently naive and juvenile looking, and often I just lean into that aspect of style. How would you describe your personal animation style? I see a lot of trippiness, and at times both polished and grimy, if that’s possible.​..
My style is nebulous, and that's because its always a result of me responding to new processes I've learnt or new artists that I'm interested in. Generally my interest lies in the ability for animation to deliver something that looks alive, changeable, and driven by perspective. I'm often asked about drugs and trippiness in my work. I guess that's because animation is ideal for exploring surrealism, distortion of perspective and a juvenile state of mind (laughs). I have also had a good deal of practise working on psychedelic music videos so that's informed my style somewhat. When Jules Tardy from COLLINS told me about this project he mentioned Jean Giraud and other 70s sci-fi style references which have been an inspiration for me in a less explicit way for a long time. The idea of having a go at an animated interpretation of that work was really exciting to me and being such a short segment -— it was perfect. "I'm often asked about drugs and trippiness in my work. I guess that's because animation is ideal for exploring surrealism, distortion of perspective and a juvenile state of mind!" Tell us about the direction you took your segment of the Cube’s journey in. What were your inspirations? When I first saw your segment, it made me think of some Ralph Bakshi work, or the movie Heavy Metal. Thank you! Bakshi's style is something I would love to explore more in my work! I think that comes from the grainy roughness of my segment. I was trying to lean into the acidic griminess of those 70s sci-fis. Moebius and Fantastic Planet were also big influences right from the start with this one, but it was all new territory for me so this is definitely one of those humbling experiences where a learning process is on display. Here is a GIF of me trying things out for the sun character, as well as an early sketch of the final shot. Scale and space are such defining elements in the imagery that inspired me, like the illustrations of Moebius, but I worry that might not have translated that well into the lens of animation or video, especially as we view videos today often on such tiny screens. If I were to do this again I would be less tethered to that as an element of the style, and work with larger less detailed forms -—putting more emphasis on texture and colour. It's true that I always see ways I could improve on my work- but retrospectively I am now able to look on past work and appreciate them for how they are. Often unintentional effects are what make the work special. Generally I try to focus on the animation process, so over visualising how I think the video should be, I try to be intentional about how I build the imagery using layers and frames. You’re the fourth animator in this series, following Golgotha, Laurie Rowan and Dasha Chukhrova — all bringing disparate styles to the table. How do you like how it’s all coming together? I love working in these kind of fruit salad scenarios because I become aware of how other animators produce their work and its an amazing opportunity to learn from them. Pulling it off though relies on a really solid underlying thread, and that's thanks to the director in this case. The central character of the Cube works really well as something that can be recognised through the lens of all six animators. What’s the New Zealand animation scene like? Is the homegrown talent holding down the local fort, or are they slowly taking over the world? Animation is such a global scene, and all the animators I know interact with an international community of animators and illustrators and film makers. My work is the same, most of the projects I take on are like this one — with people based overseas. My illustrated GIFs are the best place to see new styles I'm trying out. I'm also working on a short film that will be out in mid 2019, so thats exciting.